Guairá Falls is a series of immense waterfalls on the Paraná River along the border between Brazil and Paraguay.The total height of the falls is approximately 114 m (375 ft), while the largest individual cataract is 40 m (130 ft) high. 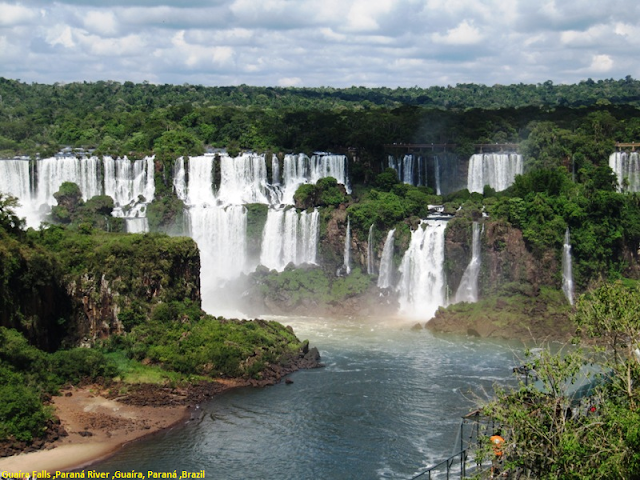 The roar of the plunging water could be heard from 30 km (20 mi) away.The falls is located at a point where the Paraná River is forced through a narrow gorge. At the head of the falls, the river narrowed sharply from a width of about 380 m (1,250 ft) to 60 m (200 ft). In terms of total volume, the largest waterfall on earth. 1,750,000 cubic feet of water fell above this waterfall each second on regular, when compared with just 70,000 cubic feet per second for Niagara Falls. Even so, the falls were flooded in 1982 when a dam was designed to take advantage of this massive flow rate.